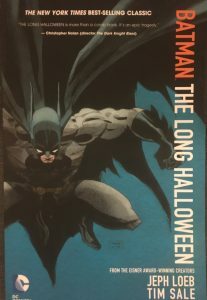 Batman: The Long Halloween follows our favorite dark crusader as he deals with Gotham during an extra intense autumn. 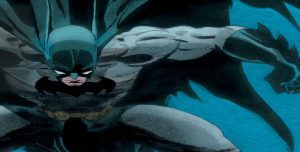 Jeph Loeb, the same author behind the critically acclaimed Batman: Hush and Batman: Dark Victory, weaves an amazing tale that is enjoyable all year around. Relive some of Batman’s earlier days as he works with Lieutenant James Gordon and District Attorney Harvey Dent to bring a mysterious serial killer to justice. 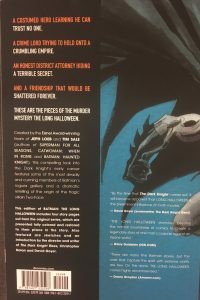 Batman: The Long Halloween was written as a follow up to Batman: Haunted Knight (but not in chronology) by the same team and served as the basis for Dark Victory. 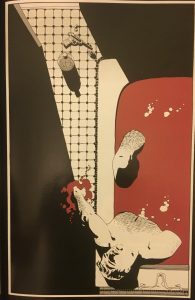 Originally printed as a limited series one shot with 13 issues. This amazing story has some distinct artwork to say the least. Although it is not one of my favorites, I think it expertly captured the atmosphere of the franchise. Having been published back in the 90s, it certainly may not compare to today’s comic standards. However, it is a great example of that older-style comic look. Bold contrasts and interesting color choices make for an art style that really stands out. For long-time fans, it certainly is easy to spot from the other installments. 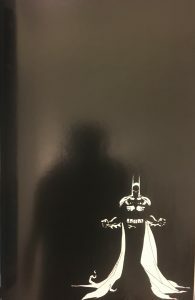 The cover art was certainly interesting and really complimented the format of the comic. As the story follows through the different holiday seasons starting in fall, each chapter represents a different holiday; Halloween, Thanksgiving, Christmas, Valentine’s day, St. Patrick’s Day, April Fool’s Day, Mother’s Day, Father’s Day, Independence Day, Roman Holiday, and Labor Day (ending off with the concluding chapter). While each chapter focuses on the same overall conflict, they all address a different immediate situation and holiday. The story itself opens right up to that Godfatheresque image that many people have come to know and love. Drama, violence, and organized crime that any fan of detective stories would love. It doesn’t take long for the action to really come into play. Most of this is really centering on the crime lord, Falcone. His character is the perfect embodiment of privilege and corruption among every branch of Gotham’s social and justice system. As anyone knows, organized crime is a major issue with Gotham City. As one of Gotham; s most elite, Bruce Wayne gets to witness much of the action in a very firsthand way. 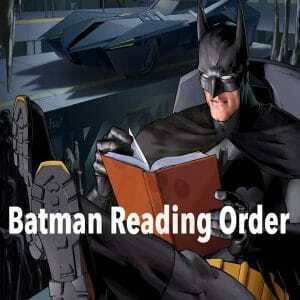 In efforts to bring down the criminal who appears to be above the law, Gordan, Batman, and Dent join forces. Rather early on, Gordan himself makes an agreement that would define the rest of the story. In fact, it is one of those quotes that I think perfectly captures the franchise as a whole. This was a strong opening that not only perfectly sets the scene for the tale to come, but introduces the cast of characters who will prove significant for the remainder of the installment. 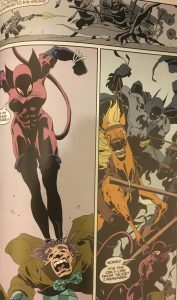 For one thing, I am always someone who is happy to see Selina make her way into the story (Loeb and Sale would move on from Long Halloween to make When in Rome) -in and out of the Catwoman persona. She is even playing an active role as someone who wants to help the cause instead of some other roles she plays where she is just a playful rival. I really like the dynamic she adds to the storyline as she tends to be a vigilante-hero type with loose morals and a much different goal. 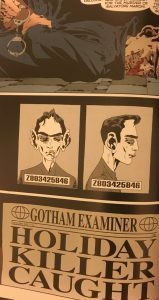 Also, for those who are long-time Batman fans, you may have already guessed it but the origin of Two-Face will be explained by the end of the installment. I’ll touch on upon this later with appropriate spoiler warnings, but it is certainly one of the pivotal moments of the comic that really stand out as one of the most important events. As the story continues, the situation escalates. People are dying monthly as the trio really struggles with bringing forth justice without crossing the lines. What I think this comic did really well was that they really tried to show the human side of the trio members. Instead of just focusing on the problem at hand and the men in their “jobs.” Loeb really tries to show you the men behind the situation. 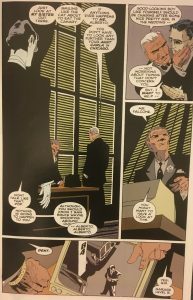 He tries to present readers with a glimpse of their personal lives -and how the choices they have made to defend Gotham are affecting them directly. I think this added a bit of depth to the overall storyline that makes the characters more relatable and the plotline itself more engaging. It also really gets you to start thinking in the minds of the characters. One of the biggest mysteries you will face in this story is obviously who is the killer. Skillful writing will provoke you to think a little bit deeper in it as you question whether or not everybody in the trio stuck with the initial agreement. After Falcone’s nephew is murdered on Halloween and more of his connections continued to be taken out as time goes on, Dent becomes a prime suspect to readers as you get a bigger understanding on everything that is going into this personal battle. Is this just skillful writing meant to turn you on the hero or is there a little more to this puzzle? Honestly, I would highly recommend that you read this and find out for yourself before reading the spoilers below! That being said, there will also be a lot of villains that readers will encounter on the way. From the Joker to the Riddler, many fan favorites will make an interesting appearance at one point or another. I think this is really where Batman: The Long Halloween excels. The spectacular writing was really able to capture the different elements and tricks you would expect from the characters. Instead of repetitive scenarios, encounters with the villains are all district and have that element of personality to them. 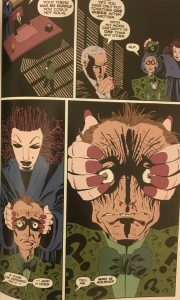 They also are that creative and mind-boggling scenarios one would expect to be in the Batman franchise. With tonnes of action scenes and a clever plot, any comic book fan can really appreciate these stories. Without spoiling too much, I think one of the most noteworthy encounters was that between Batman and the Joker around Christmas. I have to say I was a little disappointed he didn’t get April Fool’s Day at first, but honestly, Christmas really suited him. The cheery carols and creepy rhymes really made his character something as he commented on living in a “Winter Wonderland” while reading about murder and kept making references to The Night Before Christmas. 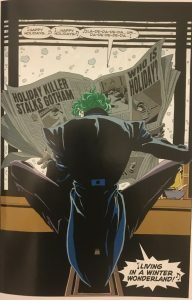 Above all, what I think really separated this story from several other in this installment were the dynamics between the Joker and the other characters. 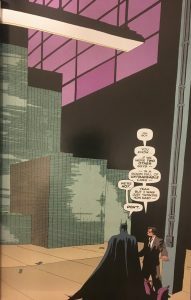 One big thing was how he made comments to Harvey Dent about how he was good, but “not Batman.” I believe this scene specifically really showed Batman’s determination. Even after terrorizing the city and putting people in danger, he literally murdered someone! 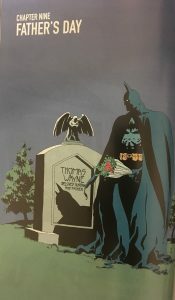 Still, Batman goes out of his way to preserve the Joker’s life as he had time and time before. This act of mercy really defines Batman as a hero. However, we know this is not the biggest villain story of them all. Most noteworthy of all of the villains is, of course, Two-Face. This comic marks the birth of Two-Face and provides an origin story that will entertain you just as much as it will shatter your heart. Harvey Dent has been a treasured and important member of this trio in and out of the comics. It was even joked about in the beginning that there was a point at which James Gordan suspected Harvey Dent as being Batman himself. 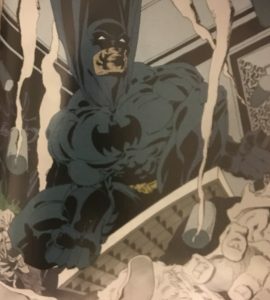 Yet, after a freak accident that was truly undeserved, one of our heroes gets horribly disfigured and suffers permeant, visual scarring for playing his part in protecting Gotham. Harvey Dent makes the transition from hero to villain in a horrible way that shocks readers who weren’t expecting it and really hits hard -even for those who are expecting this twist. Watching his fated encounter with Gordan and Batman is also just as depressing. It really sends a message to the readers about the state that Gotham is in. I think the events around Harvey Dent are what really separates this installment from the rest. Oftentimes, we get a sad origin for some unimportant character who only plays a role of relevance within the specific story. With Two-Face, however, we watch as a beloved hero crosses over to the dark side in a depressing and awful change of events. In a way, and what I believe Loeb was trying to get across to readers, is that Gotham is messed up. The corruption and horror that Gotham has become really is an awful formula for creating madmen and supervillains. If the believed Harvey Dent himself is not free from this character-changing torment, is anyone really safe? Is trying to stand up against crime worth it when it comes at such a cost? 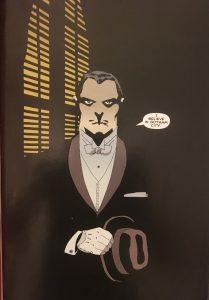 Although, I must admit Two-Face is not one of my all-time favorite DC characters, I think he is a really important character to illustrate the state that the universe is in and this comic masterfully demonstrated this. Overall, this comic is easily a 5/5. I believe it is one of the most brilliant Batman installments of all time. Honestly, I think that a mix between an amazing plot and well-designed characters not only entertained its readers, but also encapsulates everything it means to be in the Gotham universe. Once you get passed the less-than-noteworthy illustration, this is a perfect comic for any fan. I would highly recommend this comic for any fan.